The consistency and quality of Gevrey-Chambertin’s premier cru vineyard Clos Saint-Jacques is so high that in many vintages, it is on a par with grand cru wines. In 2015, this was certainly the case; I rated Clos Saint-Jacques as high as many grand cru reds such as Corton, Clos Vougeot and Echezeaux. This hillside vineyard, only 6.7 hectares in size, is a walled vineyard, clos in French, with a special meso-climate. The large 2-meter wall that encircles the vineyard protects it from prevailing winds and the fairly steep site faces southeast, enabling warmer growing temperatures and more consistent ripening. 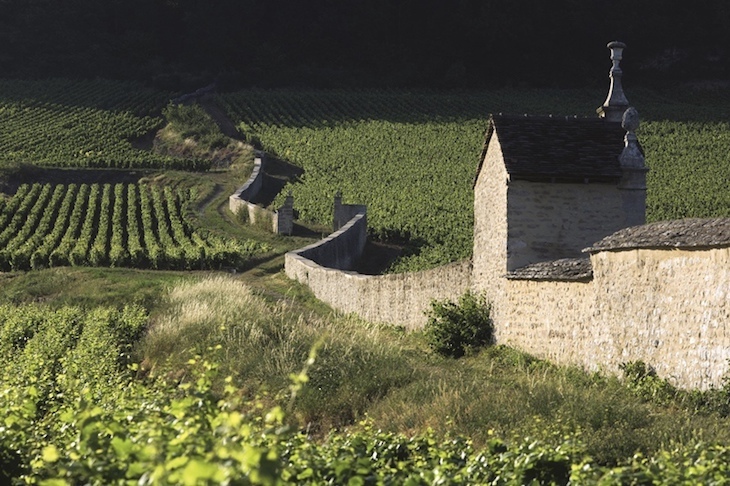 There are only five producers, all quality-conscious, making Clos Saint-Jacques: Rousseau (with the largest holdings), Sylvie Esmonin, Fourrier, Bruno Clair and Louis Jadot. With the plot divided among such top producers, the consistency and reliability of Clos Saint-Jacques is very high. I was fortunate enough to taste Clos Saint-Jacques from four out of the five producers in 2015. As you can see from my tasting notes and ratings below, all the wines were of very high quality. The 2015 Clos Saint-Jacques from all the producers below, are wines to lay down for at least ten years before enjoying. This special cuvee of Clos Saint-Jacques Cuvee St Honore possesses a more delicate expression that the normal Clos Saint-Jacques. Everything about the wine is fine, detailed and lacy. There are brilliant layers of flavors that range from fresh herbs, savory spices to mixed red berries. There is a haunting subtlety and lovely minerality in this wine. Long finish. This is one of the most successful Clos Saint-Jacques from Fourrier that I have tasted in recent years. A glorious wine with amazing layers of flavors, from violets and roses to dark cherry and red plum fruit. Tannins are ripe and firm, providing a backbone to a wine that will no doubt age for 20-30 years easily. The finish is incredibly long. Concentrated ripe red berries dominate the palate and it is supported by suave tannins and lifted freshness. This is a beautifully composed Clos St-Jacques with delicious sweetness and ripe mixed berry fruits. Tannins are fine-grained and silky, lifting the flavors towards a long, sweet finish. This is a sensual Clos St-Jacques with layers of lovely, impressive flavors and gorgeous aromatics. Enjoy the black plums, violets and sweet spices; with each sniff and taste offering even more intoxicating flavors. An intense wine to savor for its plush tannins and long finish. 60% whole clusters were used in this vintage and 100% new barrels for aging. This is a very successful Clos St-Jacques for Jadot with subtle, layered flavors supported by very ripe, supple tannins. The texture of the tannins are gorgeous – velvety and supple despite its density. Find plenty of dark berry fruit and savory herbs in the background which should evolve and open up nicely over the coming few decades. Best after 2023.